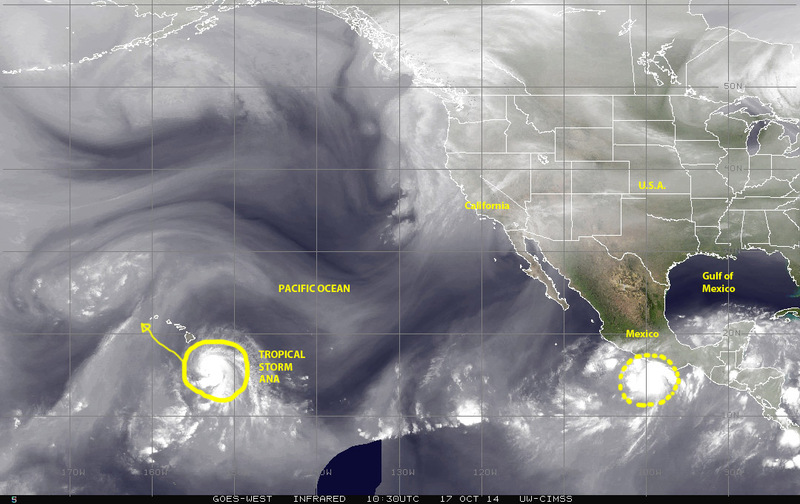 02 November 2014: It is all in the Pacific! It was it the low to mid 40s [degrees Farenheit] early this morning of Sunday 2 November 2014, and much colder in central and northern Florida. Could this be a sign that winter is approaching? For some in the South and other places in the U.S.A. with snow on the ground and freezing wind-chills WINTER is already here. Despite these signs of the approaching change in seasons tropical cyclone activity is present today at both ends of the northern Pacific Ocean. Ten thousand kilometers apart Tropical Storm VANCE over the eastern Pacific and Typhoon NURI over the northwestern Pacific reminds us of just how active the northern Pacific basin has been so far in 2014, in terms of cyclonic activity. 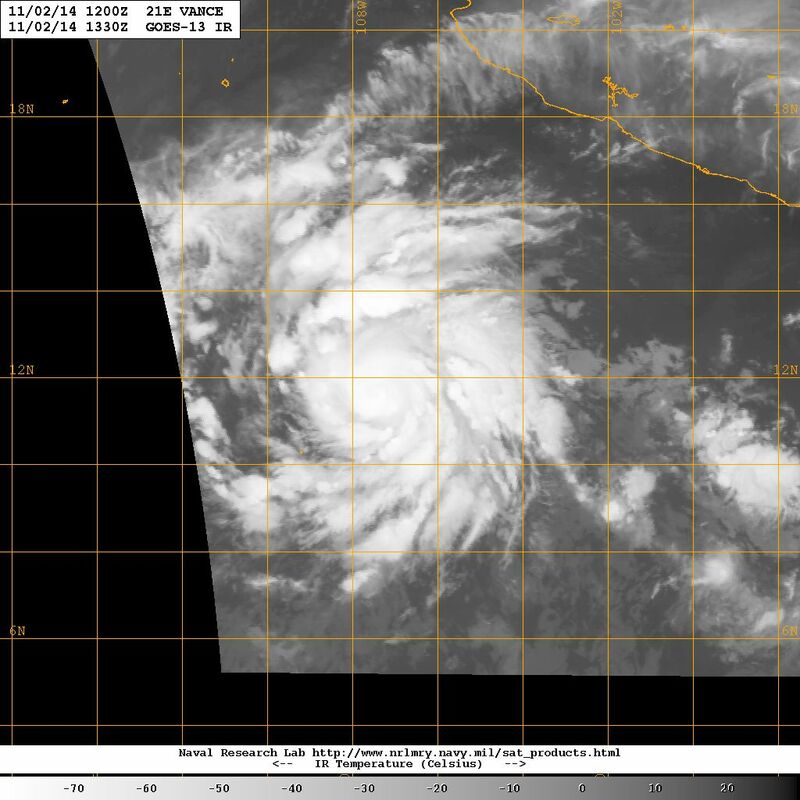 Tropical storm VANCE is strengthening, and may become a hurricane over the next 12 – 24 hours, as it begins to change its course toward an eventual turn toward the NE in the general direction of Cabo San Lucas in the Baja California peninsula and Mazatlan. 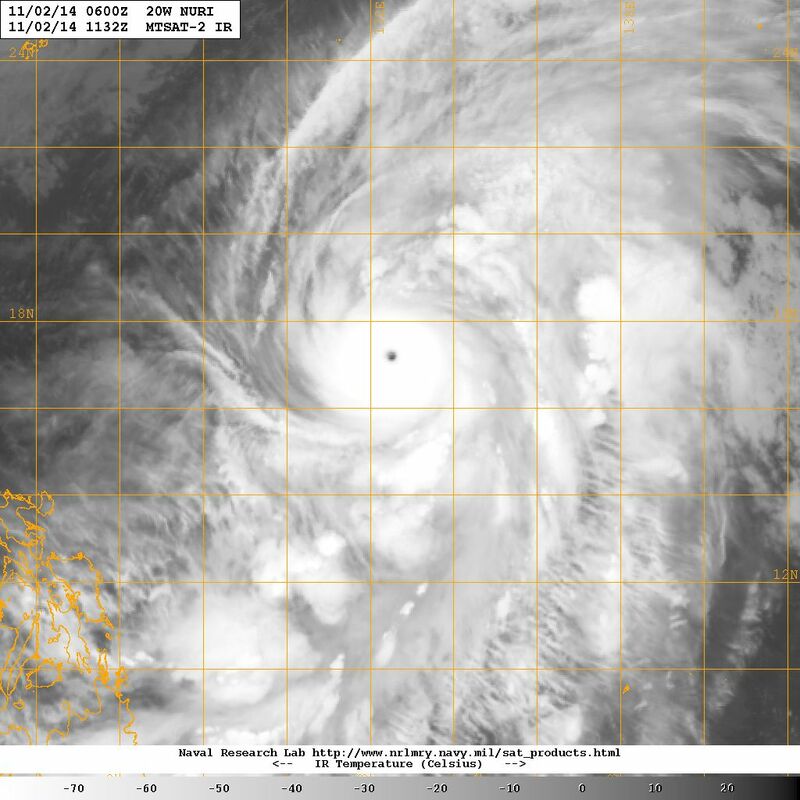 VANCE is the 20th named storm of what has been a record-breaking East Pacific hurricane season in 2014. Typhoon NURI brushed past Guam a couple of days ago, and it is now a strong category 3 typhoon that is continuing to strengthen as it tracks into a favorable ocean-atmospheric environment and continues to change course toward the waters off eastern Japan. As the years comes to an end, it will be interesting to look back and take count of what has transpired in terms of cyclonic activity in 2014. There have been some interesting events that will be worth examining in greater detail. As I write this two recent tropical cyclones come to mind because of their longevity. One is tropical storm ANA, which tracked by the islands of Hawaii to then veer North and NE before being ‘picked-up’ by a system that carried it all the way back to the mainland of Canada and the U.S.A. northwest eventually affecting the U.S.A. all the way to the mid-west more than two weeks later. 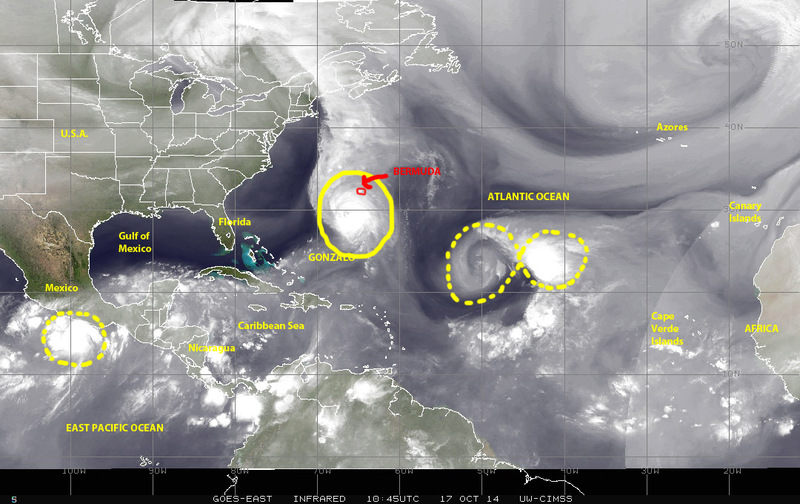 A similar story was Hurricane Gonzalo, which was generated over the west-central Atlantic near the Virgin Islands and Puerto Rico, hit Bermuda and continued toward extreme eastern Canada and eventually mainland Europe, where it continue on an eastern track until it caused extreme rains and flooding in Greece more than two weeks later. It will be interesting to analyze what contributing factors made both ANA and GONZALO last so long, travel so far north and then east, and affect such a wide region. Satellite view (NASA) of major hurricane GONZALO as it approaches Bermuda in the late night of 16 October 2014. 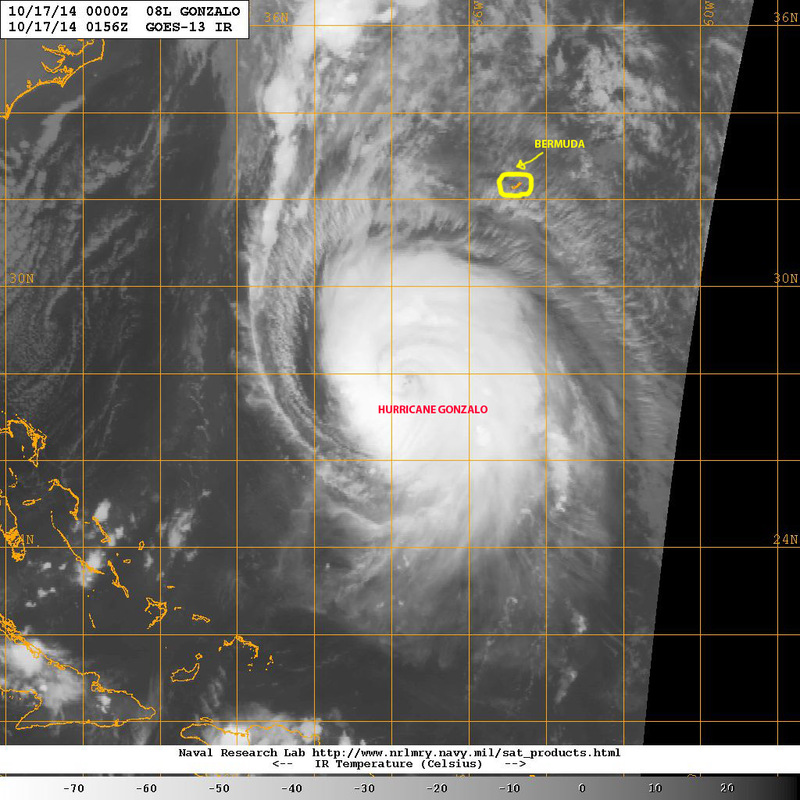 Notice the comparative sizes of the hurricane and the island. This morning of Friday 17 October 2014 the island nation of Bermuda, a veritable speck of land in the middle of the Atlantic, stands in the path of approaching major category 4 hurricane GONZALO only the 7th named tropical cyclone of the 2014 Atlantic hurricane season. Although GONZALO may weaken slightly as it travels across cooler surface waters and encounters wind shear from the west, it will still be a strong major hurricane as it reaches the island. Based on past impacts a 3.5 m storm surge and breaking waves of 4 m above that are possible as the brunt of the hurricane interacts with the coast line of Bermuda. As this hazard event unfolds in the Atlantic, tropical storm ANA is approaching the state of Hawaii in the Central Pacific ocean, but if the projected track remains as accurate as it has been up to now, it would appear all of the major islands of Hawaii will dodge a direct land-falling hit from this storm, which is forecast to pass to the south of the islands. Strong storm surge and wave impacts may still take place especially in Oahu and Kauai. Some 5000 km to the east of Hawaii a strong tropical wave is moving toward the Pacific coast line of Mexico in the general direction of Acapulco. While this storm system appears to be strengthening it may not develop further as it reaches land. Despite this possible lack of cyclonic development, this storm is already generating copious amounts of rain along a wide coastal region, raising the potential for dangerous flash floods and coastal flooding. Elsewhere in the world is relatively quiet in terms of cyclonic activity, although there are a couple of cells of disturbed weather approaching the Philippines Sea in the Northwestern Pacific, and for the first time in a long while we are also seeing a potentially cyclonic system in the southern hemisphere waters of the southern Indian ocean. We can expect to see more of these as the southern hemisphere spring progresses toward summer.